The dam at Lake Nelson has been under repair since the late fall. Instead of the lake, there is a small stream running down the center. 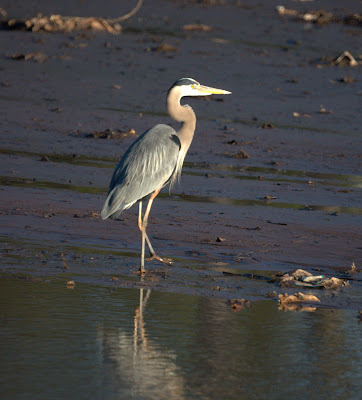 We've had a few great blue herons fishing in the stream. On Thursday, there were three at once. With all the rain we got on Saturday, Lake Nelson filled up completly. While having coffee early this morning, Mike saw a small duck, and it turned out to be a female hooded merganser. Now, it's not our best merganser photo, but we are happy to have the lake back, if just for a day, and even happier to have the hooded merganser stop by.